The aristocracy of Santiago had a particular devotion to Our Lady of Carmen. Even the army considered her its patron. Possibly because of this, on that 24th May 1891, Fr. Bernardo Aranguiz, when baptizing the child, added the symbolic name of "Carmen" to her first name "Laura". The tender bud now open to the life of grace, was in this way entrusted to the maternal care of the Queen of Saints. The baptismal register records that Laura Carmen was the daughter of Joseph Dominic Vicuña and Mercedes Pino. He was an officer in the army. He belonged to a distinguished family, perhaps to one of the lesser branches, but he was always proud of his famous name of Spanish origin. His wife, Mercedes, was Chilean, high-spirited and very beautiful. There was a touch of nobility about her. Although the daughter of ordinary farming people, she had a knowledge of music and sewing. Here begins the tragic history of this family. In fact at the Baptism only the godfather, Wenceslaus Calderon, and the godmother Rosaria Rojas were present, no one else. The Vicuña family had disowned Joseph because he had married beneath him. As far as they were concerned, Mercedes Pino did not exist. Notwithstanding this, her joy was very great as she held in her arms the little one to whom the priest had said: "Receive the white garment and carry it without stain to the tribunal of God, to gain eternal life...". Indeed, in spite of her unfortunate desiny, Mercedes guarded her child's 'stole of innocence' as if it were a most precious coat of arms. Chile was going through days of dramatic change. The President of the Republic, Joseph Emanuel Balmaceda, who was supported by the Vicuñas of the conservative party, had to abdicate because he was unable to break with the rigid position of the old regime. In a desperate effort to avoid civil war, he proposed as candidate fro the Presidency a Vicuña, Claudio, but it was already too late. The revolution broke out because of the action taken by the navy. Santiago was experiencing days of martyrdom, through steel, fire, and bloodshed. Joseph and Mercedes, living in the city center near the Church frequented by the nobility, quickly became aware of the danger. Laura, born on the 5th of April, could be baptized only fifty days after her birth, on account of the war which raged relentlessly. With the fall of President Balmaceda, there erupted a violent reaction against his supporters, among the first of whom were the Vicuñas. On August 28th the rebels entered Santiago and mowing down hundreds of victims, they seized power. One eyewitness who remembers those days says, "It was sufficient to be called a Vicuña or a Balmaceda to be persecuted to the death." Having first been disowned by his family, Joseph is now on the run, rejected by the fatherland which he had passionately and loyally served. Mercedes follows him into exile. Laura rests close to her heart and would never know the desolation of those frightening months and months of fleeing from one countryside to another with few belongings, just the bare essentials. Laura Carmen, already eighteen months old, became seriously ill at Temuco. The anxiety of Mercedes and Joseph grew. Life was hard and poor and the climate was severe. 1893 dawned and saw the birth of a little sister for Laura, Julia Amanda. The joy experienced for this gift of life was short-lived. In Santiago the new government (non-conciliatory in approach), had got to power and the leader of the insurrection, George Montt, was nominated President of the Republic. Joseph, cut off from the life and happenings in the capital, alone and hopeless, felt like dying. He was a good, gentle type of man, dignified in bearing, and rather small in stature. This was how Mercedes later described him to Laura. He died of pneumonia within a few days. Emanuel Urrutia López, still alive in 1955 and a witness during the process for the beatification of little Laura, gives us this description of Mercedes Pino: "She was born like myself in Collipullí, in the province of Bìo-Bìo, so I knew her from her infancy. She was a self-possessed young lady who knew how to get on in life." But now, on account of this recent misfortune, her life again began to show the signs of tragedy. For love of Laura and Julia, the young widow -- barely twenty-eight years old -- began to spend long hours sewing. She took up dressmaking again. Then with the savings, she bought a shop, a haberdashery store, like those generally found in centers scattered in the deserts and out-of-the-way places. She was courageous and strong. She took in hand the tiller of her tattered boat and steered it through very difficult waters, careful of her two little ones, whom she tenderly protected. Laura reminded her, each time more clearly, of the features and gentle character of her lost husband. Julia instead reflected the liveliness of her own temperament. To go back to Santiago was out of the question. She did not search out either the Vicuña family or her own relatives. She worked and smiled for her customers, but in her heart she wept. Temuco was for her a terribly sad place, a land of exile, full of violent memories. One night -- we are already in 1899 -- unknown thieves broke into the store and cleared everything. Who would claim justice for a widow in that country of outlaws? No one! Mercedes, defenseless, saw snares and threats increasing all around her. So she decided to leave for ever that land which had increased her sorrow and had placed her in the way of such dangers. During the fine season, caravans of emigrants passed from Temuco towards the Neuquén in Argentinian away the key, Mercedes set off with her two children towards a new future. She was full of hopeful optimism but without any definite goal, without anyone to lean on. Was it inexperience on her part which made her do such a thing? It was being said that the Neuquén offered great wealth in the newly growing centers. These spread out along the valleys, where races (estancias) were being marked out, with lands stretching away as far as the eye could see. All she needed to do was cross the Cordilllera of the Andes. Mercedes set out in the southern summer of 1899, joining up with a caravan of business people. A few weeks previously, along those very same mountain roads there had passed another caravan, and Mercedes knew about it. Fr. Milanese, a courageous Salesian, had then reached Temuco in 1898 with two Sisters and a young aspirant. They had intended reaching Junin de los Andes by crossing the Cordillera, but the early and long drawn-out winter prevented them. They remained for nine months at Temuco, where they zealously sowed the seed of the Gospel. They left in January 1899. The whole town had watched that departure consisting of horses, guides, mountaineering equipment and a conquest for the Lord in the person of a young girl of Temuco, Frances Mendoza, who had followed the Sisters, attracted by their ideal. Perhaps Laura Carmen, already eight years old, had seen and got to know the Sisters. One was Italian, Sr. Angela Piai, and she was in charge. The other was Chilean with the lovely name of Rose Azócar. The aspirant was Carmel Opazo. Mercedes was going right into the very heart of the mountains in search of a more tranquil life and an easier one, but the storm clouds were already closing in on top of her. The good God was preparing a haven for Laura, but for her mother a 'lightening conductor'! The haven was to be the Salesian College (children's school) of Junin de Los Andes, and the lightning conductor was non other than Laura herself. However, while Fr. Milanese's caravan was heading southwest towards the lakes, Mercedes went northwest. She crossed the Andes, made a first stop at Norquin, one of the few cities of Neuquén area, also called 'the strange land of the Triangle'. It was territory only recently opened up, and to it came those seeking adventure, speculators of every kind, traders avid for a quick haul of money, evaders and deserters of every race and nation. The missionaries used to say: "Were it not for some women and girls who had a Christian education in Chilean schools, and served as a beacon in the middle of such moral darkness, Norquin would be a place of perdition." The Christian sense of the family had been lost and when this happens, everything collapses. The undaunted Mercedes immediately senses the gamble, the risk of finding herself alone in this strange, unknown land, and without anyone to support her. She set off again, in search of better fortune at Las Lajas, towards the south. It seems that there she made friends with some people who were reputed to be more trustworthy and honest in their dealings, and whom Laura, later on, recalls with affection. However, the hard, uncertain life forced Mercedes to move a third time. Towards the end of 1899 we find her near Junín de Los Andes. The winter of 1899 was a severe one for southern Patagonia and the Neuquén area. Las Lajas was situated on the banks of the forceful waters of the Neuquén from which, in fact, the region gets its name. Torrential rains and heavy snows along the whole chain of the Andes resulted in swollen rivers whose angry waters left destruction in their wake. This deluge of water from a love and below is a vivid image of Mercedes's own state. In a desperate effort to get on top of misfortune, she clung to a man, who in her eyes seemed to be a raft in the swirling vortex of her own insecure life. How did she get to know him? We do not know. He was a certain Manuel Mora, a South American cowboy (gaucho) of ill repute. He came from Chos-Malal where he had served prison sentences for crimes unknown. he frequently had recourse to the dagger and the revolver. He stopped off at Las Lajas and 'swooped down' like a condor, a bird of prey, on the victim. he had belonged to a well-off family of Buenos Aires and had obtained from the Governor a permit to work a fine stretch of land along the folds of Chapel -- the chain of mountains which encloses the panorama towards the Andes. He was a perverse individual, but capable and ruthless. He had built up two ranches (estancias) for raising cattle in a short time. Then he invited his two brothers to join him, to share his wealth and to accumulate more. When Mercedes came to know him he was about forty; a good-looking, handsome man. On horseback, elegantly dressed, armed with a long dagger which had a silver hilt, he appeared superior to everyone else. He treated the natives like slaves, as he did the servants, horsemen, and shepherds, and used the whip on men and dogs alike. This self-made lord knew how to be chivalrous and charming when he wanted to. Mercedes clung to him as though he were her anchor of salvation. She thought he would be the protector for herself and the children, so she followed him. Perhaps she thought she could rebuild a home life. She dreamed of wedding bells, but she was deluding herself. In those out-of-the-way places, unfortunately similar cases were not infrequent at the time. Manuel Mora, intact, had no intention of marrying her. Another woman, Tomasa Catala, had been his mistress at the Quilquihué ranch and she had been subjected to outrageous treatment. When Mora was tired of her, he tied her to one of the horses' posts. Then branding her flesh with the red hot iron used to mark his herds, he drove her away! These were the hands into which Mercedes was about to fall. The wealthy ranch owner smiled in the direction of the widow as he crossed the threshold of the ranch. Finding again a home, perhaps Mercedes smiled too. Did Lura smile? No, it seems unlikely. Julia yes, for she was still very small. Anyone witnessing this step would pity the woman's fate and would fear for the two little girls, still so innocent. All over the Neuquén area the world had spread that the FMA (abbreviation for the Daughters of Mary Help of Christians, popularly known today as the Salesian Sisters of St. John Bosco) were opening a school at Junín de Los Andes, to provide for the education of young girls. Certainly Mercedes remembered the Sisters she had seen at Temuco. She would have known something about them. She wanted to put Laura and Julia into their care. Manuel Mora was willing to pay the monthly fee. He also paid for their clothes which were even elegant; they lacked nothing. For a short while the two children stayed at the Quilquihué ranch, "Quilquihué" meaning the 'home of the falcon'. Only a few days, yes, but already the alarm sounded for Laura. She was nine years old, but was a precocious child. She was fair skinned with dark eyes, and chestnut wavy hair. Her deportment was that of a well-educated child. The ups and downs of her early years had brought Laura to a maturity extraordinary for her age. Innocent as the angels, she sensed, as though by an innate perception, that her mother's situation was anything, but healthy. Mora, the "condor" was already meditating how one day he would 'sink his claws' into that innocence too. In the meantime he willingly paid the fees for the school. The renowned Salesian missionary of South America, Mosignor Cagliero, having considered the location of Junín de Los Andes from his vantage point on horseback, drew up a plan of action. He proposed to Fr. Milanese that they open schools there to meet the needs of both boys and girls. Junín was a border town. 780 meters above sea level in the folds of the Cordillera. This town had continued to expand through many difficulties and changes of climate from 1879 onwards. The following extract from the Salesian Bulletin of September 1899 gives a vivid description: “The building of these two schools cost us much fatigue and heartache, more easily imagined than described. The great distances, the means of transport which consisted solely of beasts of burden, the roadways which were almost impassible, the extreme poverty of the place and the hardships of the times, all these of themselves speak of the huge difficulties we had to overcome. The river Chimehuin added a picturesque touch to the little city, and its abundant waters fertilized the surroundings. However, it also presented a danger, because its sudden floods made it treacherous. That little center, then assumed great importance in the missionary’s eyes as he directed his thoughts towards the many inhabitants scattered on the high plains and in the surrounding valleys: natives and settlers, without schools or church, without help of any kind. And this area covered a radius of more than 100 km. Monsignor Cagliero planned to make Junín de Los Andes a base from which to transmit civil and Christian values, a base much more important for Argentina than the military one set up there to guard the last outpost of the Aracauni who had fled into the mountains. Within the raids of those 100 km were the two ranches of Manuel Mora. Mercedes traveled on horseback the 20 km separating Quilquihué from Junín, she introduced herself to Sr. Angela Piai and asked for two places for her daughters. She spoke little, and the Superior, Sr. Angela, did not ask questions. The lady had on an elegant silk cape and looked young and full of life. She gave the particulars necessary for the register as follows: Julia Amanda, six years; Laura Carmen, nine years, both Chilean; Parents: Dominic and Mercedes Pino, Chileans. At that time almost all the houses in Junín were made of wood and rough bricks and the school of Mary Help of Christians was not different. It was among the poorest of mountain dwellings with a zinc roof, narrow doors and low windows. It was in the form of right-angle and had a garden and well in the center and an uncultivated vegetable garden facing the open country. In the house everything was primitive. The sofa on which Mercedes sat was none other than the trunk they brought from Chile covered with a cloth. In the whole house there was only one table which served every possible need and this meant that it was continually being moved about. They also had a chair and some benches, and that was the sum total of the furniture they possessed. Laura sensed this charity, rooted in the Gospel, from the moment she first entered the College. At Junín there were plenty of opportunities to practice a spirit of sacrifice. For example, the washing was done int he waters of Chimehuin; the bread was kneaded and baked at home once a week; the vegetables often consisted of wild grass taken from the fields. Laura and Julia had arrived at the school on January 21st. It was summer and holiday time. Why did Mercedes not wait for the beginning of the school year before parting with her daughters? Her heart was broken, but she had to do it. The ranch at Quilquihué, the ‘falcon’s haunt’, would never be home for them. Those two children were always the center of her life; the living heritage of Dominic Vicuña to whom she was devoted and whose memory could not have been for her in her situation, anything but a bitter reproof. He would have had them educated in a manner worthy of their ancestors. So it was better that they left Quilquihué immediately. Julia, or Amandina as she was called in the school, burst into tears as she clung to her mother’s dress. Laura too seemed sad and thoughtful, but for other reason. She threw her arms around her mother, assuring her that she would take care of her little sister. When the moment of parting was over, Laura felt happy as her inner feelings of anguish quietened, and so she set out to face a new life. Fr. Crestanello assures us: “She was overjoyed.” And he tells how Mercedes was amazed at her reactions when she knew that she was going to the school. Laura then confessed to the priest that she could not explain the reason for this deep joy which took over like a fountain of clear water. “It's true, however, that I was happy,” she used to say. “Baby Jesus must have been pleased with my mother’s decision.” Mercedes, therefore, must have given God a place in the hearts of her children. “Laura was happy because Jesus would be pleased.” This is something to be said for Laura’s mother in such a difficult position. Sr. Azócar assures us that Laura could read and write a little and could say some prayers. She had very little religious knowledge, but she had plenty of what could lead her to understand the Divine. Her Innocent heart was ready to discover God, that most fascinating of all discoveries. We could compare her first days at the college to an ‘overture’. One breathed in the poor college of Junín an air of Gospel love, an atmosphere of fervent piety and serene joy, all of which is the result of the family spirit which is typically Salesian. Being holiday time, the days passed happily, and the rhythm was not too regular. There were only the Superior and Sr. Azócar in the house, and Laura followed them everywhere and chatted spontaneously with them. She noticed their patience with Julia who was moody and at times capricious. She admired their serenity and peace, and was drawn by their pleasant ways, since she found them always available and approachable. Soon she learned to live according to a timetable, to look after herself and her personal belongings as well as those of her sister. But above all she learned to follow the Salesian Sisters into Chapel for prayer. It was there that she made the marvelous discovery of a personal God, who is above all Father; of the Son, God made man, a victim of love for man and put to death because of sin. On her knees in the plain little room, which served as the Chapel and housed the Blessed Sacrament, the innocent child repeated the prayers she knew and those she was learning. So there was a serious meaning to life. Santiago, Temuco, Norquin, Las Lajas were only stepping stones along the way to this discovery. And she also heard: “Try to practice virtue from your earliest years because to wait for old age is to put yourself in very grave danger of being eternally lost.” Eternally lost! Because of Sin! And immediately her thoughts flew to her mother, to Quilquihué. What had the child seen at the ranch? A pure soul is capable of deep intuition. It can distinguish between what is opportune and what should not be done. It reacts instinctively to evil. Laura would not have been able to put into words the very big change she had seen taking place from the time her father was alive in Temuco. Yet in a confused way, she understood that her mother had gone far away from God. Alongside the first wonderful discovery, the terrifying fact of eternal perdition pierced her soul like a dagger. Love for Laura, meant a desire for the loved one’s peace with God, the priceless gift called grace! The crucifix from the altar spoke to her more clearly every day, of cruel martyrdom and she did not realize yet that Junín was going to be for her the mountain of sacrifice! In the little School of Junín, they taught a variety of subjects, both academic and practical. There was reading, writing and arithmetic, as well as domestic science, home-management and the first elements of civic education. The students, fourteen boarders and seventeen day-students, were all girls “who found it easier to handle the horse’s reins than the pen and the needle.” They came from the Cordillera, from as far as six hundred miles away. Used to the free life of the vast open spaces, they opened up and grew strong, almost like wild plants, usually docile and inclined to piety, but self-centered and inconstant. They were taught singing too, for its refining influence, and so that they would be able to perform in Church and at the little family celebrations. But above all Christian formation was given first place in the education of these girls, on whom depended the first announcing of God’s message in the Neuquén. Laura drank deeply at the spring of religious knowledge. Sr. Azócar was her teacher since the child had been admitted to a course for the older girls. It would correspond to our second or third class in the elementary school. The school year finished with solemn prize-giving on January 1st, 1901. Laura got the one and only prize for conduct as well as the prize for hard work and application. Then the children set off in the direction of the Cordillera and their distant homesteads. Mercedes, who had come for the prize-giving, brought back her daughters to the ‘estancia’ at Quilquihué. She had been told that at the ranch she would be able to pray… that God was near to those who call him. The Salesian Sisters at Junin were not really aware of Mercedes’s true situation. Laura returned to Quilquihué in fear and trembling. The herdsmen, horsemen, shepherds and their families all looked at her with great admiration. Mercedes was rather anxious, but for that summer, Manuel Mora treated Laura with respect. She, however, shivered at the very sight of him! As often as she could she sought refuge in prayer. But her mother obliged her to pray in secret. Why? The long rides on horseback, life in the open, the plentiful food helped her health immensely, so that her physical development seemed to speed up to keep pace with her precocious spirit. The days followed each other without great variety and yet they only served to increase in the child an indefinable torment. She feared for herself and she felt a great compassion for her mother. When she was told that it was time to go back to the college she jumped for joy. “I am going back to my favorite place!” She was thrilled to get back there. Right away she wanted to go to confession. She opened her heart to Fr. Crestanello and renewed her commitment to grow in virtue. She enjoyed meeting her teachers and companions again. Laura was a happy child and she willingly took part in the lively recreations. However, a keen eye could notice a trace of sadness in her. The Superior understood, a secret sorrow was gnawing at her soul. And to give her comfort, the only comfort possible, she admitted her with two other companions to her first Holy Communion. When she told her the good news, Laura remained speechless. But immediately her thoughts flew to Quilquihué, to her mother and she broke into sobs. There was a new teacher at Junín, Sr. Anna Maria Rodriguez, who had the job of preparing her for the great day. She did it in a manner worthy of the One who was coming and of the soul who was waiting. The ground was well prepared and the seed was first-class. The solemn function took place on June 2nd and it was the first time such a celebration took place in the school. Mercedes arrived in Junín on the eve. She brought Laura a white gown, sewn by her own hands; there were many other little gifts too, like soaps, perfume, sweets. The child would have wished for something very different. When she was told that her mother was in the parlor, she ran and threw her arms around her joyously. “Mother!” she said, “tomorrow I will be making my First Holy Communion. Forgive the displeasures I have given you. If in the past I have been naughty, from now on I want to be your consolation. I will pray for you.” And she began to cry. 1. O my God, I want to love and serve you all my life, so I give you my heart and my soul, my whole being. 2. I want to die rather than offend you by sin, so I intend to mortify myself in all that might take me away from you. 3. I propose to do all I can that you may be known and loved, and to repair the offenses which you receive each day, especially from the members of my own family. 4. My God, give me a life of love, of mortification, of sacrifice! Francesca Mendoza, the young lady of Temuco who had joined the Sisters, afford, and then repeated it under oath, that observing Laura as she came back to her kneeler after Communion, dignified and composed, she noticed a crown of three stars on her head. Everyone noticed this singular child, who they said, seemed like a little queen, but no one else saw what Francesca maintains she saw. Mercedes, lost among the crowd, was measuring the abyss which separated her from her little angel! A sculptor is not born such, neither is a surgeon, a teacher, a seamstress, and much less a saint. Who was it that said, "Saints are born that way?" It is not true. We are all born sinners. The grace of Baptism opens the way towards great heights, but it does not substitute for nature which down the years carries its old wound. Laura felt humiliation deeply. The three stars which Francesca Mendoza had seen shining on her head could not have been an impression, but it is true that in the life of this young Chilean girl every virtue shone as a star and acquired greater splendor from humility. It in turn maintained its own radiance because of her heroic spirit of mortification. Her appearance and early physical development were no indication of excellent health, in fact she was rather delicate. Actually, if we remember her infancy and early childhood, this is not surprising: always on the move, poverty, fears, had been her lot. She suffered from a humiliating discomfort which became worse in winter. At Junín de los Andes there was no heating and in the cold season the temperature went down below zero. Laura suffered from enuresis (bed-wetting). How many humiliations because of this weakness! While the boarders were getting up a young girl acted as vice-assistant, as the Sisters were in Chapel for meditation. That young girl forced Laura on more than one occasion, to carry the wet sheet on her shoulders. The affair was mentioned to the Superior and she intervened and forbade such a cruel punishment. And Laura? She was extremely sensitive. From her expression one could sometimes see the effort it cost her to be silent and humble herself, as attested Sr. Grassi, who belonged to the Junín community in 1901. One morning Merceditas Vera, one of the first boarders and already aspiring to Salesian religious life, burst out crying while Laura underwent the humiliating punishment. The two girls were great friends. They shared the same aspirations. Merceditas was a few years older. Laura, however outshone her where spiritual formation was concerned. "Why are you," asked Laura "Did you by chance cause some displeasure to Jesus?" "I'm crying because of what they did to you," replied Merceditas. "It's not worth it," said Laura. "Didn't they dress Jesus up as a fool? Why shouldn't I accept a little humiliation, being so naughty?..." Neither Laura nor Merceditas liked beetroot. Sr. Piai, knowing their virtue and wishing to prepare them for religious life, ordered beetroot for the two of them three times a week. At table their little friends offered to eat their share instead. Merceditas questioned Laura with a glance, "Will I? Won't I?" "No," replied Laura with a firm voice, "our obedience must be perfect. Jesus suffered so much for us on the Cross!" It happened that once the two friends were in the workroom, Laura asked, "Merceditas, who are you working for?" "For Jesus and Mary," replied Merceditas. "Right! Let's do like Mother Mazzarello and make every stitch an act of love of God!" It was evening, after supper when Laura and Merceditas asked permission to leave the game to run and say a prayer at the statue of the Sacred Heart, which stood on a fairly high pedestal near the entrance. The statue was so high that the two, even though they wanted to, could not reach the feet that evening to kiss them. How were they to do it? Twenty-five years later, Sr. Merceditas recalls, "Laura prayed with such fervor and trust that the statue came down to us, giving us the joy of paying it that homage..."
Each of the older boarders had the privilege of cultivating a flower-bed in the garden and she could pick the flowers to decorate the altar. Laura and Merceditas had their flower-bed side by side. One day Sr. Piai ordered Merceditas to put down a stake to support a climbing plant in her plot. "Will you help me?" asked Merceditas. While putting the dry stick into the ground, Laura mused, "From sticks planted in obedience roses bloom. I believe it is easier for a stick to bloom than for the words of a Superior not to be the will of God." Some time afterwards, in fact, the stick blossomed. It was called the "stick of obedience." Monsignor Cagliero who came to Junín a year later, on a pastoral visit, listened to the unusual story. He wanted to see the stick. It was bearing the last flowers of the season, since the winter was coming. These flowers were picked, at Monsignor's request, and place near the tabernacle for his intentions. After Laura's death, her school friends vied with one another to have her flower-bed, and it was an ardently-desired prize to be allowed to gather the first blooms from the 'stick of obedience." Such as life, a bit like the "little flowers of St. Francis," and perhaps much more. Someone, who knows who, suggested that Laura be given cold baths to cure her of her organic weakness. Outside, a pure mantle of snow extended over the mountains and valleys. The severe temperatures made one dream of a warm hearth! When the infirmaries had prepared the cold bath, she called the heroic child, who put up no resistance whatever. Laura humbly and calmly undressed, and, in spite of teeth chattering and her body trembling all over, she went into the water, without a word! She accepted this repeatedly, even though the harsh "remedy" was doing her no good. On more than one occasion she fainted. However, nothing is "ready-made." From her frequent visits to Chapel, Laura drew strength to conquer herself, to mortify herself. Had she not made up her mind to do all in her power to make up for the offenses against God, especially from members of her own family? Her mother! Her mother was the "thorn in her flesh." For her no sacrifice seemed too great. Her continual penance was leading her with giants strides towards perfection. The Superior of the college affirms, "No one could ever accuse Laura of consciously breaking the rule. Everyone noticed her constant effort to grow in perfection." Julia was asked if it were true that her sister was "a little impatient" with her. She replied, during the informative process for the Cause of Beatification, "She was always loving and patient with, ready to forgive my weaknesses, my bursts of anger, my flightiness." But virtue costs. It is not to be had "ready-made." The end of the second year of school was fast approaching for Laura. Before beginning the final exams on the feast of the Immaculate (called "La Purissima" in Spanish), the school had its first enrollment of the Children of Mary Sodality. It was another step in the formation of the young girls of Neuquén, who would later be the nuclei of Christian families there. On the morning of December 8th, dressed in white, veils on their heads, and blue sashes around their waists, the best girls in the school reminded everyone of the Roman martyr, St. Agnes. One by one they approached the altar to receive the blue ribbon and the medal of Our Lady--a visible sign of their belonging to the Blessed Virgin Mary and of their promise to live in fervent charity and as pure as lilies. It was Laura's turn. Over her the priest said, "Receive this medal and ribbon as a special emblem of Mary and an external sign of your consecration to this tender mother..." Laura's heart was overflowing with joy! During the informative process in Viedma (the initial stage of investigation into Laura's life by the local bishop as part of the process to be declared a saint), Julia spoke out about her sister's virtue, "The day on which Laura received the medal of a Child of Mary was one of her happiest days." 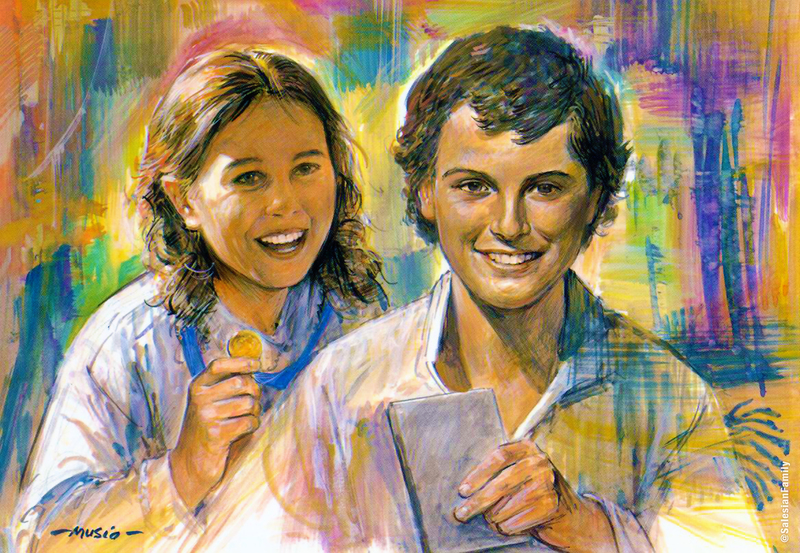 Returning to her bench with that spiritual treasure on her heart, Laura proclaimed in her heart, "Death, rather than sin" -- just like St. Dominic Savio. She was pure as a dove! Rather than become stained with sin, she chose death. It was said that Laura had a presentiment of what was awaiting her at Quilquihué. She intensified her prayer, her fervor, and her mortifications. She also did very well in her exams. After Christmas, Mercedes came to bring her daughters back with her for the holidays. While Laura was delighted to see her mother, she lowered her head fearing what is to come. Before leaving she sought advice from her confessor, and asked for the prayers of the Superior, her teachers, and companions. She was very tense when she arrived at the falcon's haunt. The condor circled high and distant, waiting for the moment when he would swoop down on the prey. Laura sensed danger in the air. Did Mercedes know? Did she think about it? Did she see it? Manuel Mora, arrogant and tyrannical, vulgar and cruel, was not gentle even with her. Her life at the ranch was becoming more difficult and more pathetic every day. However, her foot was already chained and each day that passed was a fresh blow of the hammer driving her deeper into slavery. It had already been said that the owner of the Quilquihué did not intend to marry Mercedes Pino. One of Laura's companions, Julia Cifuentes, notes that "Mora's preference was for Laura and that he was having her educated to marry her." But the man was to realize that he was making a mistake. Manuel Mora's house, rich and comfortable, surrounded by green and warmed by the summer sun, would have been an ideal place for a rest for Laura, were it not for that "evil," that danger. When Mora tied his horse to a post and entered the house by way of the veranda, where they normally passed the day, Laura would quickly vanish. Let's hear the story in the words of Claudia Martinez, a lady of Junín, who was on very close terms with Mercedes after Laura's death, "One day, Mora threw Mercedes out of the house, wishing to be alone with Laura. The girl, however, resisted him and managed to save herself from his assault." Mercedes, heart-broken, watched from the window. Mora defeated, planned another attack. Fancy being faced up to by a twelve-year-old girl! Some time after this episode there was a celebration for the branding of the animals born within the year: sheep, goats, and calves. The shepherds and their numerous flocks came from long distances. First there was the dipping and shearing of the sheep, then the branding with fire, and on the last day, a great feast which ended in excessive drinking. The ranch resembled a countryside fair. Besides the shepherds, the servants and their families, there were present also the rancher's friends--owners of the neighboring ranches. There were drinks, games, and singing as they waited for the supper, and to be followed by a great dance at night. The women, dressed for the feast with dazzling shawls on their shoulders, were coming and going with refreshments and drinks. Manuel Mora was already enjoying the conquest. Like the condor, he was trying to hypnotize the dove. Laura, seeing the perfidious eyes fixed on her, called on the Madonna to help her. The supper was almost over. The dancing began. The young girl would have liked to retire. But how could she? Pale as a ghost, she waited for the show-down which she felt was near. Mora began the celebrations and took the floor for the first dance. Laura saw him coming towards her. She swore in her heart, "Death, but not sin." To his invitation she gave a firm and decided "No!" Manuel Mora felt his anger rise; nevertheless he blandly insisted. The girl repeated, "No!" The guests were watching. His tone became stronger, he insulted her. He was in his own house and Laura, still firm as a rock, refused. Mercedes was anxious and tense. What could have happened? After all Mora had only asked for a dance. A dance? She well knew how that type of dance could end. Mora now passed from words to deeds. Ah, yes? She didn't want to dance, the little saint? He seized her by the arm, and threw her out into the dark with the dogs. Having closed the door he turned round, red with rage and humiliated, and went towards Mercedes. He shouted at her and ordered her to force her daughter to come in, to ask pardon and to dance with him. What did the mother say to her daughter in the dark of that Andean night? The fear of worse evils made her implore Laura to go back in. In the end, what's in a dance? Perhaps the woman had forgotten the scene she had just witnessed through the window. But Laura certainly remembered it! So the girl said no also to her mother. She took refuge among the trees in the dark. In the house the dance went on. Not, however, for Manuel Mora, who haughtily watched the entrance. The door opened and Mercedes entered alone. Mora launched his imprecations at Mercedes. She would pay! He took her by the wrists and dragged her outside. If the fires had not been put out, and the brand beyond arms reach, the unfortunate woman would have had the same fate as Tomas Catala. The dancing was over. Mercedes was tied to a post. No one, not even Mora's brother dared to intervene. He whipped her until the blood flowed. The friends mounted their horses and left. Part 21: "I am Dying for You"
"Mary is my mother. What consoles me most is the thought that I am a Child of Mary." "We must offer sacrifices to God for the salvation of souls." "Be devout to Jesus in the Blessed Sacrament and to Mary Help of Christians. Be constant in virtue." "It is Mary who gives me strength and joy in these moments. She is my mother." "Love Jesus and Mary and you will be happy at the moment of death." "My God, give me a life of love, of mortification, of sacrifice." "We will be reunited in heaven." "Be loving and kind to your neighbor. Do not despise the poor. Do not treat anyone with coldness and you will be respected by all." "If Jesus wants it that way, then I do too." "Yes, I suffer gladly. My one desire is to please Jesus and Mary." "I hope to go soon to see Jesus and Mary. I would like to go to confession so as to prepare myself better for the big step." "You must know how to suffer and to forgive each others' failings, and love each other as good friends." "Since I cannot work and I am near the end, it is right that you should pray a lot for me, so that the Lord will give me patience and happiness in my pain and suffering, and His holy grace to others." "Virgin of Carmel, take me to Heaven." "It seems to me that God Himself keeps the memory of His presence alive in me. Wherever I am, at school, in recreation, everywhere, the thought of God is with me, to help and console me." "If we remembered often that God sees us, how many failures we would avoid. There would be no need for Assistants! We would do everything well." "What good fortune it would have been, for me to die in your house, O Mother." "We must live only for Jesus. I will consider myself a little fool for Jesus." "I cannot keep back my tears when I think of how Jesus humbled himself for love of us." "O longed-for Heaven, when will you come?" "O Jesus, since I cannot be accepted among those who consecrate themselves to you in the Institute of the FMA (Daughters of Mary Help of Christians, Salesian Sisters), I offer myself completely to your love. I want to be all yours, even if I have to remain in the world." "From sticks planted in obedience roses bloom. Remember, Merceditas, just as a dry stick can bloom, so can God speak through the voice of Superiors." "Let us make an effort every day, Jesus suffered so much for us on the Cross." "O Mary, we confide to your Immaculate Heart our consolations and our griefs, our fears and our hopes. Be our peace in the storms, our shield in battle, and our refuge in time of need."